Assembly Sq., er, I mean Assembly Row has come a long way from the days of the Loews movie theater and Good Times. It's all shiny and new, with upscale stores and restaurants opening every day. My friend Peggi and I had dinner at Papagayo, the upscale Mexican restaurant that opened just 4 months ago. I was inclined to hate it from the moment I walked in. The space is one large room, including an open kitchen and there are over 15 large flat screen TVs mounted all around the restaurant. I had a view of 9 TVs from where I was sitting. The restaurant has a too trendy, inauthentic vibe, like the Mexican version of P.F. Chang's. The reviews have mostly dinged the restaurant for poor, inattentive service. It seems like they have read the reviews and are now going overboard the other way – our waiter came over 4 times to ask us if we were ready to order. I finally I had to tell him that I would flag him down when we were ready. Despite all that, I ended up enjoying our meal. 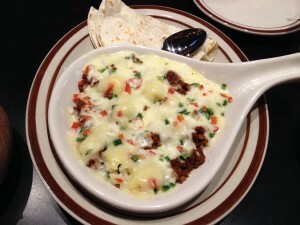 We started with the Queso Fundido (pan seared chorizo, Oaxaca, Asadero and Chihuahua Cheeses, $8.45). It was a generous dish of chorizo covered in a blanket of melted cheese. It came with soft flour tortillas, but we opted to eat it with the complimentary chips. The dish was a little salty, but satisfying. 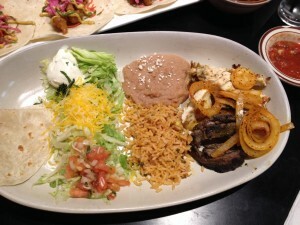 Next, we shared the fajitas and were able to get half beef and half chicken ($13.5). It was a large platter of re-fried beans, Mexican rice, lettuce, tomatoes, cheese, sour cream and sautéed onions. I was surprised and pleased that the meats were not overcooked and everything was well seasoned. 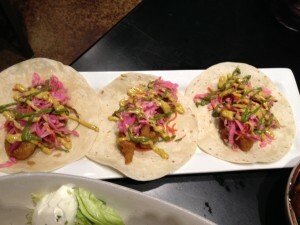 The shrimp tacos ($15 for 3) were pretty to look at, topped with pickled cabbage, verde sauce and avocado. The breading on the shrimp was heavy, rendering the shrimp indistinguishable from any other protein, but it was fried well and added nice crunch to the soft taco. I was surprised that they were flour tortillas, not corn. All the sides are reasonably priced at $3. 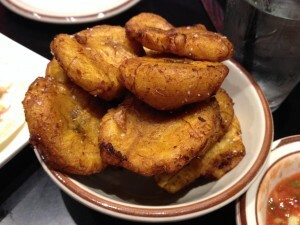 We had the fried plantains were inconsistent – some were delicious, and some were too thick and undercooked. 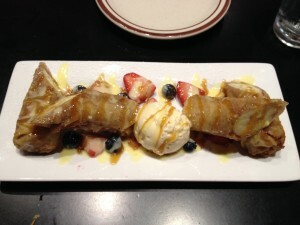 The banana taquitos ($7) was a generous portion of banana wrapped in a thin tortilla and deep fried. It was tasty, but filling. We wanted more ice cream and less taquito. I think Papagayo achieves its aim; it is a comfortable, upscale Mexican restaurant that has margaritas the size of your head. The food is better than you would expect and they are working on the service. The price points are higher than your standard hole in the wall taqueria, but they need to pay for all the electricity for the TVs.